Using Instamed, in the Patient ID field, put the patient name and dates of service you are paying for. We also accept PayPal for those that prefer. 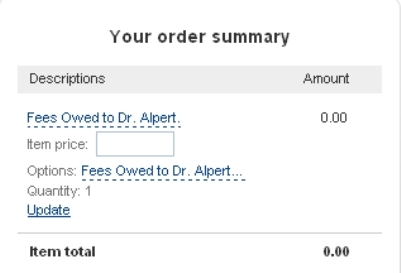 Please click on "Buy Now"button, then put in fees owed on "item price" on screen that pops up, hit update and continue to pay. PayPal Helpline is 888-221-1161 and will assist if you have difficulty. Pop screen is shown below for information only.